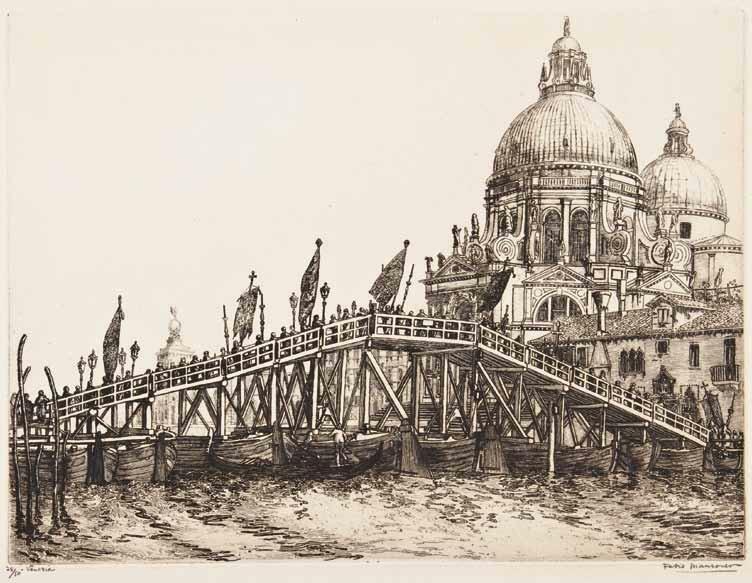 The Mattatuck Museum presents Reflections & Undercurrents: Ernest Roth and Printmaking in Venice, 1900-1940. This exhibition of approximately one hundred prints concentrates on a group of American etchers and their Italian counterparts who captured a fresh view of the ancient city in the first half of the twentieth century. The exhibition runs through August 26, 2012. Reflections & Undercurrents features prints by artists who, following the lead of the great American aesthete and expatriate artist James Abbott MacNeill Whistler (1834-1903), explored in their art the picturesque aspects of Venice. The artists represented in the exhibit include German-born American painter and etcher Ernest Roth (1879-1964), who trained at the National Academy of Design and was one of the foremost etchers of the early twentieth century; John Taylor Arms (1887-1953), known for his technically-accomplished etchings that include astonishing levels of detail; Joseph Pennell (1860-1926), who, in addition to having made many prints in a variety of media was also a devoted follower and biographer of Whistler; and Whistler himself, who is represented both by a print in the exhibition proper as well as by the Museum's addition of its own etching, an example of the 1879-1880 Long Venice, which depicts the familiar Venetian skyline from a distance. Reflections & Undercurrents is based on the extensive research of Eric Denker, Senior Lecturer at the National Gallery of Art in Washington, D.C., a long devoted fan of Venice whose publications include the 2003 exhibition catalogue Whistler and His Circle in Venice (The Corcoran Gallery of Art, Washington) and an etiquette guide to the city co-written with his friend Judith Martin, better known as "Miss Manners” (No Vulgar Hotel: The Desire and Pursuit of Venice, 2007). Reflections & Undercurrents is a traveling exhibit organized by The Trout Gallery, Dickinson College, Carlisle, Pennsylvania. For more information on all of the museum’s programs, events, and exhibits visit the website at www.MattatuckMuseum.org or call us at (203) 753-0381. The Mattatuck Museum is operated with support from the Department of Economic and Community Development/Connecticut Office of the Arts, and is a member of the Connecticut Art Trail, sixteen world-class museums and historic sites . Located at 144 West Main Street, Waterbury, the museum is open Tuesday through Saturday, 10 a.m. to 5 p.m., and Sunday, noon to 5 p.m. Convenient, free parking is located behind the museum on Park Place.